This web page was created after seeing and reading the daily nonsense being attributed to Al Capone. From a simple bootlegging gangster, to now being named in conjunction with the U.S Presidency. It's simply amazing how the persona of Al Capone has evolved over the many decades! So many Capone rumors and myths have been handed down through the years in order to tie Al Capone to a book, movie or product. Some perpetuated by faulty research, some by companies and some even by actual relatives whose faultering recollections seem to recall a certain time, place or product associated with their beloved Al. Some companies will go as far to pay a Capone relative to make it more believable. The winning recipe of repeat a lie many times and it will suddenly become truth seems to prevail over simple straightforward fact. Back it up by a relative and voila! instant fact! Even I have been approached in the past to try and tie a bed and breakfast place with Al Capone. This was an attempt to boost their business. Of course, I refused and have continuing disdain for people trying to make a fast buck by selling lies. From a house owned in Cuba, to a supposed trip through tunnels in Saskatchewan, we explore some of the myths surrounding Big Al. Below I will state the myth and tell the truth about it. 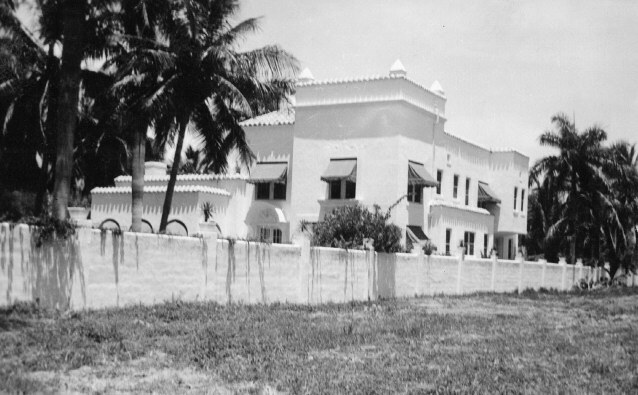 The Myth: Al Capone's home in Miami was originally owned by Clarence Busch of the Anheuser Busch beer company. The Truth: The house was built in 1922 for the Pennsylvania born Clarence M. Busch. He was a successful realtor and is not a relative to the famous brewing Busch family from St. Louis. These people were never related and that's one of the myths passed down through time. Even when the house was being repetitively sold, this brewmaster myth was being continually perpetuated as fact. The realtor Clarence Busch had this house built with a few others as an investment, because he had a dwelling at the time on Brickell Avenue. The house was actually owned by James W. Popham at the time Capone was interested in it. Capone did not go seeking it, but was actually approached by hotel owner Parker Henderson Jr. and then Miami Mayor John Newton Lummus Jr., who was also a realtor. In 1928, a few realtors in Miami eagerly wanted to sell Capone a home. Henderson and Lummus just figured they could find him a home themselves and showed Capone a few. Capone was immediately hooked on the one at 93 Palm Avenue. James Popham was furious when he found out through insurance records that Al Capone was to be the new owner of the house. 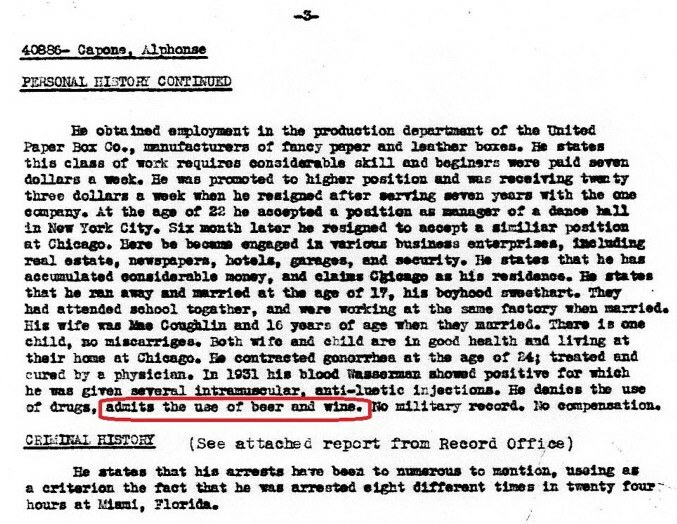 As far as the beer family story goes, they didn't even have a family member named Clarence! This easily verifiable myth continues to this day in many books and documentaries. 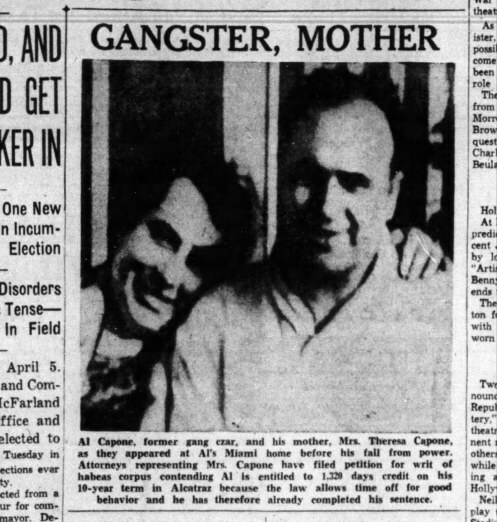 The Myth: Al had a sister named Rose Capone. The Truth: No, Rose never existed and was an error on John Kobler's part when interviewing people during his initial research. This was accepted as fact through the years and misrepresented in subsequent books and documentaries. The facts are that Al had 6 brothers and two sisters and they were Vincenzo (James), Ralph (Raffaele), Salvatore (Frank), John (Erminio), Umberto (Albert), Amadeo (Matthew) and Mafalda. The other sister was named Erminia and she was born on August 11, 1901 and died on June 18,1902. There may have been another stillborn male in the family, but it can't be verified through records. The Myth: Al Capone's voice was recorded. The Truth: No, there is no known recording of Al's voice. The talking pictures began in 1930, and equipment to make it was very expensive, so chances are Al just missed the time to be recorded. I also don't think Al would ever have wanted to be recorded saying something he couldn't take back. Near the end of his life, great care was made to watch over him in case his pareisis made him spill any mob info. There was no danger as his disease had regressed him somewhat. Although there is a supposed silent home movie of Al taken in 1929, hanging around his Florida pool with Charles "Lucky" Luciano, Ciro Terranova, Frank Costello and others. Photos exist of this encounter. These were taken right before the Atlantic City gang meeting in May. For the film no sound is heard. As far as what his voice sounded like, Chicago American city editor Harry Read wrote in his memoirs that when he first met Capone he was expecting a deep basso voice due to his hulking mass, but instead was surprised to hear a jocular high pitched voice coming from Capone. The Myth: Al Capone worked as an accountant in Baltimore. The Truth: While it is possible there is a small possiblilty that Capone could have worked as a book keeper in New York, the timeline of Al Capone's life during this period would have made it impossible for him to have worked in Baltimore. Read Capone's own account of his whereabouts during this period. If this were at all true, then you would think Al would have been proud to have mentioned a legitimate work entry during this interview. Also, all of the sources where this originated from and was repeated thereafter cannot provide any proof whatsoever. 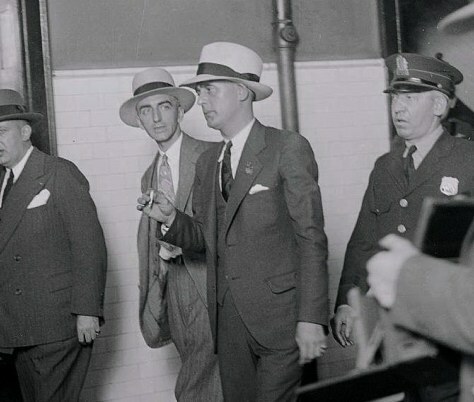 The Myth: President Herbert Hoover made it personal on getting Capone brought to justice. The Truth: On April, 21, 1930, from Capone's own mouth came the following conversation while on his boat on the bay of Biscayne while they passed by the J.C. Penney's estate. "Take a good look at that." Capone said his voice was low and serious. ''One of the biggest mistakes I ever made in my life concerns that place. That's the J.C. Penney estate where Herbert Hoover was a guest just before the inauguration last year." He continued to stare at the place. "Yes, sir, the biggest sucker move of my life!" he went on. Jack Sharkey and Young Stribling were fighting down here and Jack Dempsey was the promoter. Sharkey and Dempsey, are old friends of mine. I had a big party at the house every night with plenty of champagne and music". joke like that cause trouble now?" Capone retorted "I'll tell you how. Right after Hoover was inaugurated President one of the first things he did was call in a Treasury Department agent and ask how much income tax I paid. Of course I've never paid any. I'm told he gave orders to give me the works." The guest interjected, "Perhaps you can settle it; some do," but Capone shook his head dubiously. "I've been trying to but the heat's on me. Everything might turn out okay But I don't know...."
"Why didn't you pay the tax in the first place?" His friend asked. "Bum guesses by my mouthpieces!" he said "They told me the government couldn't collect on racket income. Now the G says they don't care where I got it -- the tax should have been paid." The Myth: Al Capone's knickname became Snorky after he became a successful well dressed gangster. The Truth: According to his brother Ralph, "It's one of his pet names. He calls every kid by that name--- especially his own boy, Al junior. He always says 'Little Snorky' when he speaks of him, and so the outfit got to calling him Big Snorky. Now he's just Snorky." The Truth: No, Al Capone didn't sit around with his gang and have a brainstorm on what his organization was going to be called. EX: Whenever he had conversations with politicians and reporters, he would mention others as having a 'racket' or as being in the 'rackets'. If it was a gang affiliated to his, then he would say their 'outfit' and my 'outfit' etc.. To give a more positive spin to his organization and whenever he mentioned his business to others, he would often use the term 'my outfit'. He used the term so much with members of his own gang to describe their thing in conversations that the name stuck, and the organization later became well known as 'The Outfit'. The Myth: Al Capone was a cocaine fiend because he had a hole in his septum. The Truth: Another wild myth. Authors will sometimes go to bat with some things they pick up on during research and make immediate assumptions. It also serves them well if it can be sensational enough to edge their books ahead of other previous Capone biographies. It's all about sales and the hopes of Hollywood picking up the book for a movie. The more sensational, the better! This cocaine myth suddenly appeared in 1994, when author Laurence Bergreen went with the story because it made his book stand out from all the other Capone biographies already out there. After finding a doctor in general medicine who agreed with his cocaine theory on Capone, he ran with it. Unfortunately, as with both his tales of "Capone as a Baltimore accountant", and "a stand in used for Sonny Capone at a baseball game", his cocaine theory that suddenly became connected to Al Capone doesn't have any credible source for it's origins before 1994. The cocaine hole in the septum, just on it's own, without the Al Capone factor, starts to take flight when cocaine hits the major limelight in the 1970's and 80's. Before that, no correlation or study showed that cocaine was the number one cause for the holes in septums. As a matter of fact, it wasn't even mentioned at all before the 1970's. In 1944, a major league baseball player had his septum cut out during an operation. Capone also had this type of tonsil / sinus operation in 1929. Would people later assume that this baseball player was a cocaine fiend just upon knowing he had a section of septum missing? This is how misleading wild assumptions can become. Sadly, AMC's Making of the Mob later took this Bergreen assumption and rolled with it on steroids. Now Capone looked like Al Pacino in the 1983 remake of Scarface, which may have a correlation with the real Capone and this myth taking flight. I know, but now doesn't a coke sniffing Capone make him sound oh so much cooler? Well, maybe for a made up Hollywood movie which today is the norm, but in reality, it's just complete unfounded nonsense! The hole in the septum can be attributed to the two following reasons. 1) Capone's longtime illness of syphilis. Most long time sufferers of latent syphilis have a hole in their septums and have what is known as saddle noses. 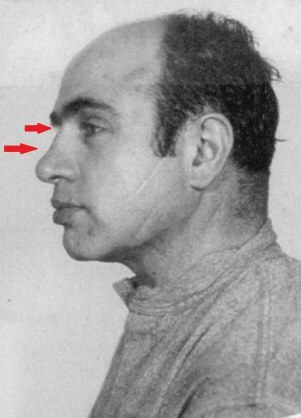 Capone side mugshots show a saddle shaped nose. 2) A deviated septum. Capone had a long history of bad sinus trouble, suffering from post nasal drip since he was a very young boy. That problem added with a few fist fights during his youth may have worsened his sinus problem. On September 5, 1929, he was operated on by Dr. Herbert M. Goddard for his sinuses and tonsils during his stay at the Eastern State penitentiary. While incarcerated at Eastern State, Al Capone was operated on for his sinus problems and his tonsils. The following shows Capone had suffered sinus troubles that plagued him for many years. According to Mae's relatives, even as a child the other school kids would call him "Spaghetti". This not because of his Italian heritage, but due to his nose constantly leaking over his lips. Atlanta Prison records May 18,1932. 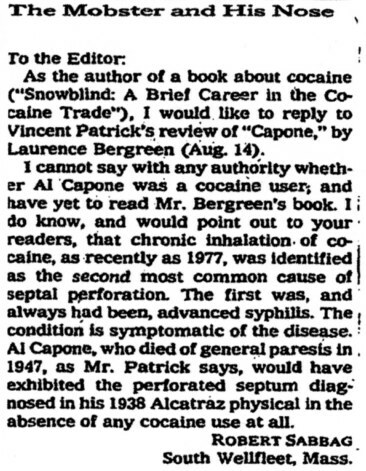 Cocaine book author Robert Sabbag's reply to an editorial written by Vincent Patrick for Bergreen's book on Al Capone. 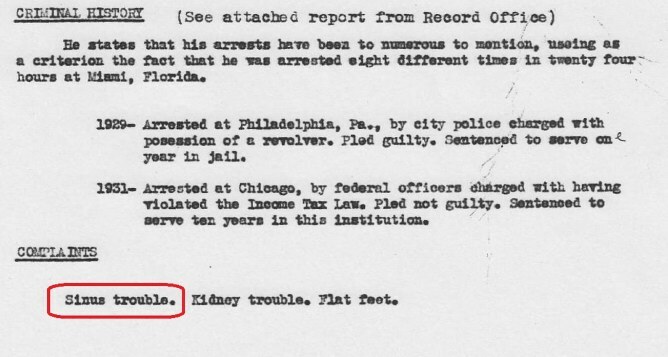 Capone's 1932 diagnosis in Atlanta. The late stage of syphilis can occur anywhere from 2 to 30 years after initial infection. Another Atlanta medical document show no use of narcotics and a 6th grade education. That pretty much dispells the myth that Al had graduated from high school. 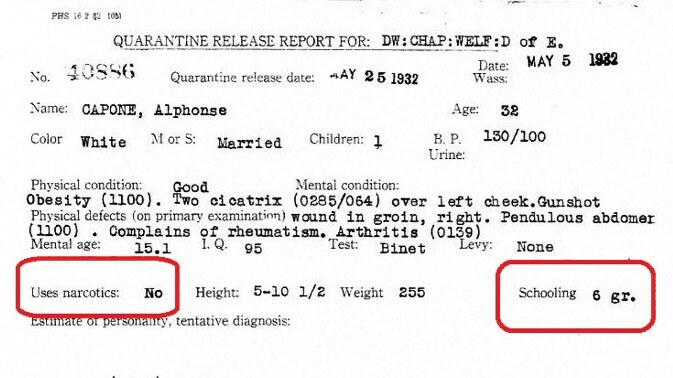 Alcatraz medical records June 4, 1938. The medical examination shows a hole in Capone's septum. So according to the myth, Capone the cocaine fiend is snorting in Atlanta Penitentiary and then in Alcatraz? 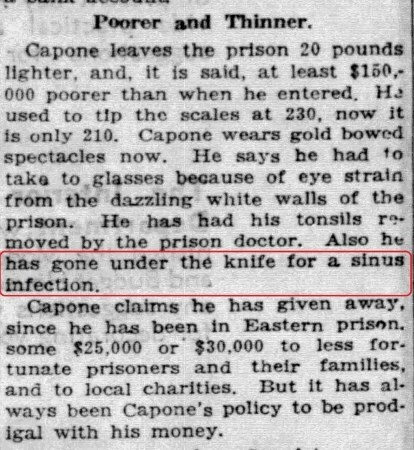 Or is it more caused by the operation Dr. Goddard performed on him in Philadelphia's Eastern State prison in 1929 to alleviate Capone's constant sinus infections? Unfortunately, the latter is less titillating, but more logical. Even if the hole was there pre-1929, how come Dr. Goddard who operated on him in 1929, left the hole there? Because maybe the hole was put there by the good Dr. to alleviate Capone's sinus problems? Deviated septum further aggravated by his latent syphilis? Or his post nasal drip that plagued him all his life? What is important to note is that the doctor in this 1938 evaluation was a Psychiatrist and not a nose and throat specialist. 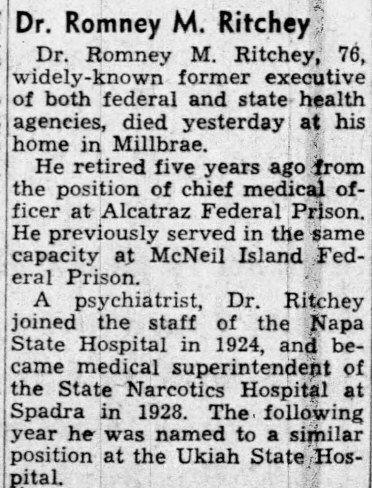 What's more, the doctor in question, whose name was Dr. Romney M. Ritchey was in 1928, the medical superintendent of the State Narcotics Hospital in Spadra, California. So if anyone would know cocaine addiction or the resulting ravages of cocaine, then I think he would have been the first and foremost to notice it up close in Capone's medical evaluation. The Dr. who evaluated Capone in Alcatraz 1938. He was once a superintendent at the State Narcotics Hospital. He did not observe any symptoms of drug abuse on Capone. 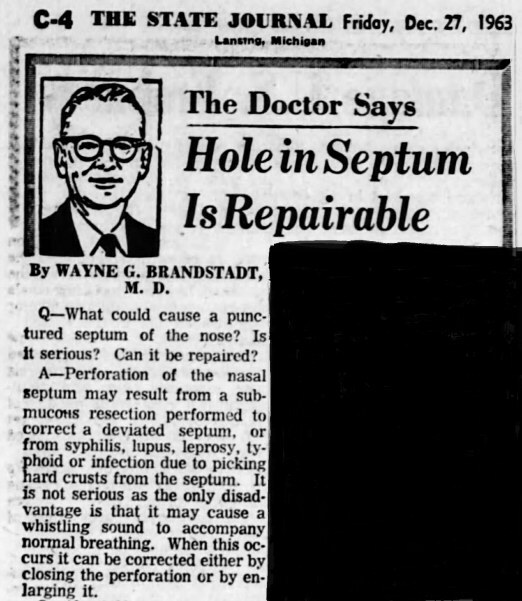 Another doctor's opinion where syphilis is more the culprit of a hole in the septum. 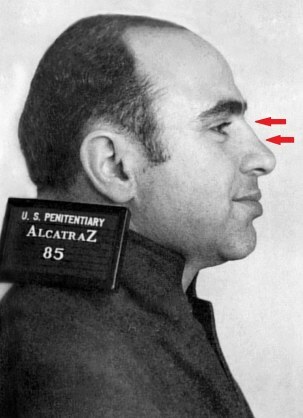 Fact is, besides the latent syphilis as the probable culprit to the hole in his septum, Al Capone was also operated for his sinus troubles in Philadelphia's Eastern State Penitentiary. So did Al Capone ever try cocaine? He most probably had tried it, maybe at a party or with some prostitutes, but was he a cocaine fiend like Bergreen or Making of the Mob says? I would say that since no one can produce any concrete evidence directly from Capone's medical files, then I would think this is just a stretch to further make the Capone persona bigger than it really was and to sell sensationalism. 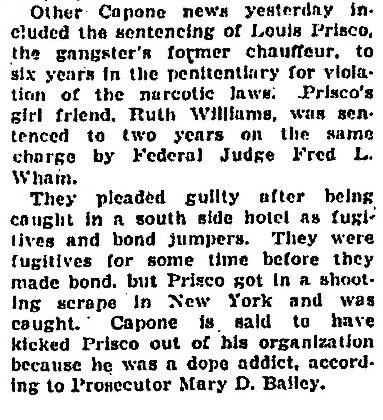 Come to think of it, too many of Capone's entourage wanted his job and they wouldn't think twice of denouncing a drug problem to other gang members, if he was truly a cocaine abuser as some claim. You would also have to question that with Capone in constant view of fellow gang members, police and his own family, then where would all this cocaine be done if he was such an addict to make a hole in his septum as is claimed? His wife Mae would get pissed with Al whenever he had one glass too many to drink, so I don't think she would not put up with the cocaine business had he had been an addict as the myth claims. Read story below. Al personally didn't like dope fiends. The Decatur Herald August 1, 1931. 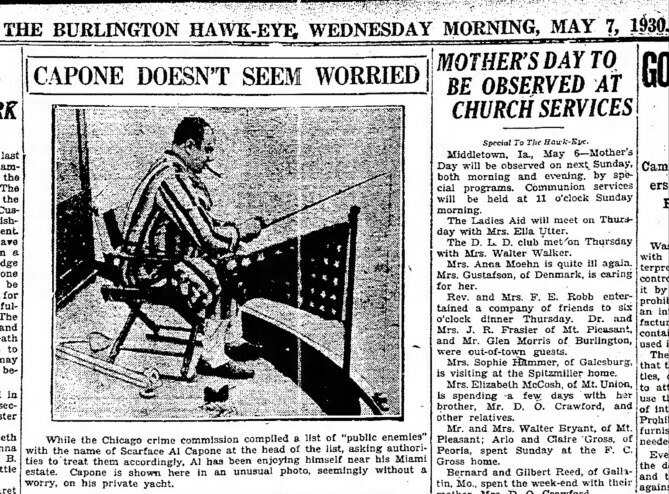 Chicago Tribune March 25, 1932. The Myth: Al Capone's favorite whiskey was Templeton Rye. Another invented myth! There is no proof whatsoever that Al ever drank any hard liquor, let alone the Templeton brand. If this is true, then I want to see the concrete proof. Probably just a marketing ploy on behalf of the company that recently associated themselves with a Capone relative. They got the relative to say this was true for some sort of renumeration and now it's sadly believed by so many out there as fact, even by some authors and historians. The truth is Al Capone did not like to drink whiskey period! Harry Read, Chicago American city editor, who was a good friend of Al Capone, recalls in his unpublished memoirs called "The Capone I knew" that in January of 1929, when he asked Capone what was his main business exactly, Capone replied that he was strictly in the beer and gambling business. Read then asked then what about the hard liquor? 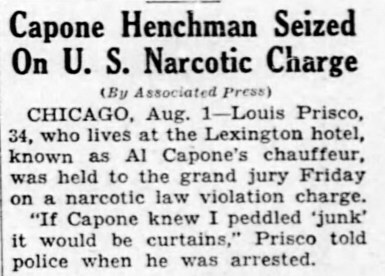 Capone said he got that through connections in order to accommodate his clients whose patrons enjoyed hard liquor and high balls. This below from Al Capone's own mouth! "Chicago is a beer drinking town. I don't drink whiskey myself. I drink beer and wine. Once and a while I will take a highball just to be sociable, but whiskey and gin are poison for any man." Capone when questioned by Cuban secret police as to what he was doing there in 1930. Drinking wine. Great Falls Tribune- March 24, 1931. I personally work on facts and records, not heresay. 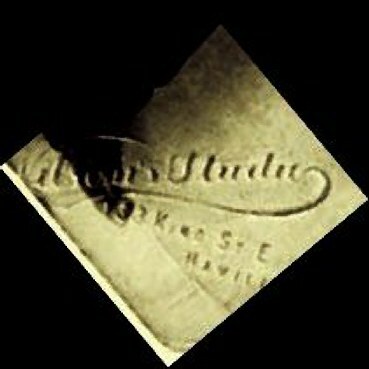 I also have researched it to death and have found no records of this brand in connection with Al Capone. They even went so far as claiming on the label that Al Capone kept some Templeton bottles in his cell at Alcatraz? Some of the Park Rangers and Alcatraz authors and historians got a good laugh out of this one! The plain reality is that Alcatraz was not kind to Capone and he had no pull once there. Templeton Rye label with wild Capone reference of having whiskey in his cell. All the facts researched show that Al Capone did not drink hard liquor. 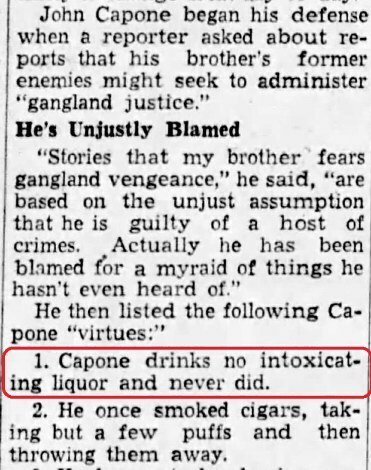 Not too surprising as other gangsters selling it such as Dean O'Banion did not drink any alcohol, and neither did Al Capone's mentor Johnny Torrio. Al Capone preferred beer, wine and champagne, the first two, which was admitted by him in a statement at the Atlanta Penitentiary during a prison interview with a physician. Beer in the summertime and wine for family gatherings, as was normal for Italian families at the supper table. Al also enjoyed cut up fresh fruit in wine. Al once got sloshed on chianti when he was released from Philadelphia prison. May 18, 1932, Al Capone admits to drinking beer and wine. No mention of liquor. Enjoying a cold beer! 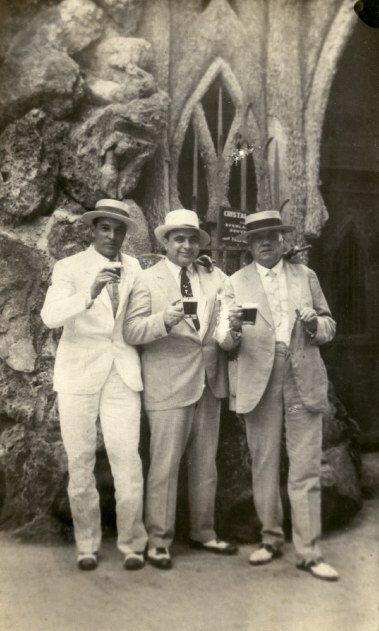 Miami lawyer James Francis "Fritz" Gordon, Al Capone and ex- Atlanta Councilman / furniture businessman Robert A. Gordon (James' father) at the Tropical Gardens, Havana, April 23,1930. In this commonly seen photo, R.A. Gordon is mistakenly identified as Havana Mayor Julio Morales. This is a mistake because the Mayor at that time was actually Mariano Gomez. Julio Morales Coello was a Cuban Navy Commander. R. A Gordon will pass away at age 61, almost a year after this photo was taken. 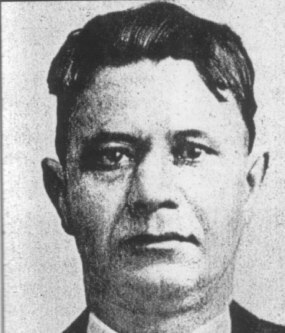 Subject Identification research Mario Gomes (Photo Credit : State Archives of Florida, Florida Memory, http://floridamemory.com/items/show/55382). No hard liquor for Al. He preferred alcoholic beverages such as beer or wine. Interview with Al's brother, John Capone, on November 18,1939. The Myth: Al Capone died a rich man. The Truth: People tend to forget that most of the money generated by the gang belonged to the gang. Al took his share and he spent it as fast as he got it. The rest was distributed amongst the gang. Other monies were for payoffs to Police, Judges, Aldermen, Lawyers. Money was also used for distilling equipment, trucks etc... Al Capone's business had an extremely high overhead. After Al's death in 1947, Mae and Sonny continued to live at the Palm Island estate until 1952, when they sold it along with all it's contents to Cleveland realtor named Thomas Warren Miller. They couldn't afford to keep it any longer. Ralph Capone had made a promise to his brother to look after Mae and Sonny, which he did right until his death. The Chicago Outfit no longer desired to help out Mae and Sonny Capone after Al's passing. Whatever monies Al Capone had in trust that belonged to the outfit went back into the gang coffers after his death. EX: In 1927, it is estimated that Capone took in 105 million. This was even mentioned in the World Book of Records. This is not entirely factual because that money was made by the gang and not Capone alone. Capone probably took 10 million for himself, while the rest was divided up by the gang, payoffs made to officials and the rest re-injected in more gang businesses. The Truth: And so it continues... I once got an email from author asking about this photo floating around claiming to be Vincenzo and Al Capone. 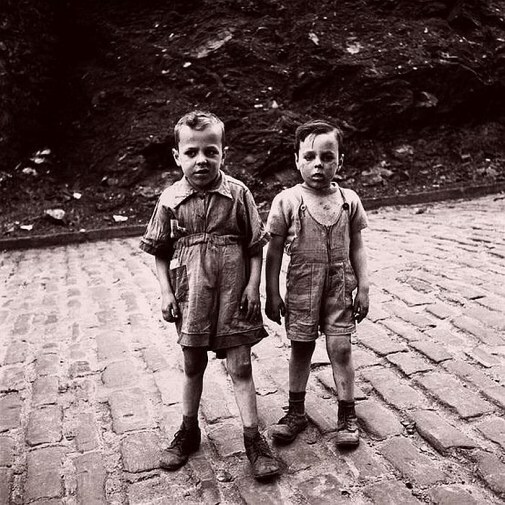 The truth is this, the photo was taken by street photographer Vivian Maier. She was born in 1926 and died in 2009, so you can do the math yourself and see that it doesn't fit the history timeline and is NOT a photo of the Capone boys! So much nonsense on the web! Visit http://www.vivianmaier.com and click on STREET 2. It's photograph number 40. 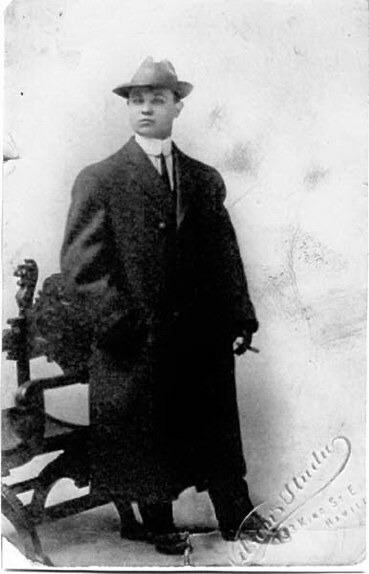 The Myth: Here is a photo of Al Capone at 16 years old! The Truth: Not Al Capone! Many people buy old photos and postcards on eBay and start seeing things! Just like shapes in clouds! Let's look at the facts! The other version floating around of this photo has the bottom right of the photo surprisingly cropped out. If we zoom in that right corner of the original photo what do we find? We find a photographer's stamp. From the photo and the stamp style we can certainly say that it's early 1900's! 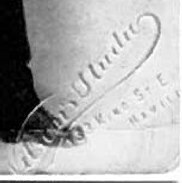 Upon close up and and darker exposure It reads as follows; Wilson's Studio 133 King Street E. Hamilton, which was in Ontario, Canada. My! My! A 16 year old Al Capone was in Hamilton, Ontario, Canada having his photograph taken. Nonsense! Al Capone around that time was 9 years old! The timeline does not fit. Even at a later time date, such as 1915, Capone would have been by that time in the USA, just a youth, left school, had steady employment, legal and illegal to help support his huge family. The Myth: Al Capone was in my town. The Truth: Chances are he wasn't. If Al was really visiting your town back in the day, you could be sure it would have made the news of your local paper. Perhaps not the same day, but at least in the following weeks. People's recollections through the years make the connection to something or someone they see later on based on assumptions. Grandpa remembers seeing Al capone as a boy when in fact it was a guy who ressembled him in height / weight and dress. He also had a couple of friends with him so we can assume they were bodyguards. I'm amazed at how many photos I have seen of people saying it's Al Capone in there when in fact he's no where in sight. Did Al Capone visit the Tunnels of Moose Jaw? No, probably not! Was Al Capone in Ontario or anywhere in Canada? No, probably not. There's a documentary making such loose claims with less than stellar research. One example: They claim Capone was in Canada and had his tonsils removed by a doctor there. Well Capone must of had two sets of tonsils because he had them removed in Eastern State penitentiary on September 5,1929, by Dr. Herbert M. Goddard. There's a straw boater that was supposedly left at a Hotel in St. Pierre Miquelon by Al Capone. Truth is the hat is no longer on display. I've seen photos of the said hat and the visible size inside of the boater does not correspond with Al Capone's head size at all, nor does it correspond with Al's preferred straw boater brand which is Bonar Phelps. I'm guessing they mistook another gangster visiting from New York as Al Capone. In reality, it would have been impossible for Al to have been in every conceivable place people have emailed me about over the years. One example of people thinking they saw Al Capone. The Daily Chronicle May 17, 1930. The Myth: Al Capone owned a houses all over the world. The Truth: I get this question alot. The answer is no. Why? Because the proof shows that Al had enough financial difficulties holding on to the house at Palm Avenue. The facts are that he owned through his wife and mother, the house at 93 Palm Avenue and the Chicago home at 7244 South Prairie Avenue. Other homes, such as a Wisconsin cottage that were used by Al and his family in the summertime were owned by relatives. (Ralph Capone etc..). The Myth: Al owned a home in Cuba. The Truth: While it is true through immigration and travel documents that Al Capone visited Cuba on a couple of occaisions, he never owned a home there. He always rented a Hotel room at the Sevilla in old Havana. The situation for a gangster in Cuba even at that time was unsure (Police and military roundups of gangsters). So the long term purchase of a house at a place that was unstable would be unheard of. The specific house often mentioned was once owned by a dentist and now a restaurant near the beach in Varadero. This was NEVER owned by Al capone nor did he ever set foot in there. I think they even mention it somewhere on the outside of the house. People seem to think Capone could go in any country or town and act like a big boss and do as he pleased. This is totally wrong and false! Capone was king in one place and one place only! That was in Chicago circa 1925-1931. Example: Al Capone tried to visit California and was immediately turned around by officials and ecorted out of town like a vagrant. The Myth: Al Capone had an Italian accent. The Truth: Being born in New York, No, he didn't. The only accent he had and lost was his New York accent. Johnny Torrio took Al and refined his rough edges in order to make him a tad more respectable for business dealings. As far as what his voice sounded like, Chicago American city editor Harry Read wrote in his memoirs that when he first met Capone he was expecting a deep basso voice due to his hulking mass but instead was surprised to hear a jocular high pitched voice coming out of Capone's mouth. The Myth: Al graduated from high school. The Truth: No, he didn't. He only finished grade school, contrary to what some people claim. You can read it yourself here in the link below. It's Al's own words under "Personal History". I'm sure if Al had graduated high school, he would have more than proudly stated it in the files recorded at the Atlanta State Pemitentiary. A 6th grade education. That pretty much dispells the myth that Al had graduated from school. 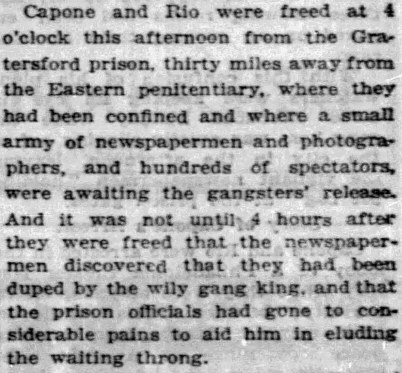 The Myth: Al Capone walked out of Eastern State Penitentiary where the press and crowds were waiting to see him. I have seen the actual film and it's true! The Truth: The only truth is that film is indeed taken at the Eastern State Prison and it is on the day Capone is supposed to be set free. The only problem is that the press and the waiting crowds were fooled by prison officials. After nearly 11 months behind bars, Al Capone and Frank Rio were secretly transferred from the Eastern State prison in a brown automobile on the evening of March 16,1930, and held at a new prison situated at Gratersford, in the county of Montgomery. This was about 30 miles away from Eastern State. They were officially released on the 17th from that location and were already half way across the state when the huge steel door opened at the Eastern State prison. This 4 hours before the prison officials annonced the ruse. Hundreds of people along with press stood along Fairmont and stared for the exact moment the gang monarch would step out of it's front door. Even Alfred "Jake" Lingle was there waiting to welcome Al out to freedom. The huge steel door finally opened. A guard peered his head outside looking both ways. From behind him appeared an Al Capone look-alike who sauntered out and passed by the press. They quickly grabbed their cameras, but soon seem to think something was off as the gentleman walked by. Lingle is fuming because he realizes that Big Al, his buddy, has stood him up for an exclusive for his paper. Al is pissed at Lingle for conspiring with other gangs behind his back while he was in jail. The Warden Herbert 'Hard Boiled" Smith steps out and announces to the press that he has stuck it to them! Capone had been already gone even before the crowd had assembled. Time and hundreds of feet of film were wasted. Many were mad at the Warden for going out of his way to accommodate the gangsters. They yelled out insults at Smith asking how much he was paid? He told them to ----- out of there! Smith claimed this was done merely for safety. Capone and Rio met up with Ralph Capone and Jake Guzik. To throw the press off their trail, rumors were put out there that Capone and party would take a chartered plane home or that they would take a train called the Broadway Unlimited and head for Pittsburgh. None of these rumors ever proved to be true. Most likely the party drove home by automobile. Left ; The fake Capone look-alike from prison release film and the real Al Capone both taken in 1930, just about a month apart. Al finally made his way to Chicago where he stopped by to ask officials if he was wanted in connection with any crime? They all said no, and Al was now on his way to a welcome home party that was planned in his honor across the street from his headquarters at the Lexington Hotel. The Myth: Al near the end of his life was fishing in the swimming pool with his bathrobe on. It must be true because I have seen photos. Even a published author / historian said so on a gangster message board. The Truth: Well, that author is dead wrong! And to prove it, he even took down his post after visiting this web site. So the answer to the question is no, the photos most people see of Al wearing a bathrobe and fishing is one where he is not sick and doing quite well after leaving the Philadelphia Penitentiary in 1930. Again, these are not photos taken near the end of his life in 1947! In these photos, he is fishing off his moored boat, (not pool) and they were originally taken on April 20,1930, right before he went to Cuba. These photos were taken when Harry Read, editor of the Chicago Evening American paid a visit to Capone at his Miami home for an interview. Al Capone was doing well at the time and was not yet affected by his disease. One of the many newspapers who reprinted the famous photo following the days of it being originally photographed. Note the date. This was not Capone near the end of his life in the 1940's. Another shot taken from that same day with Harry Read. April 20, 1930. It will be originally published in the Chicago Evening American on April 24, 1930. It appears a day later in the Chicago Tribune and in subsequent papers the following weeks. These photos are now oftenly mistaken for a sick Al near his final days. 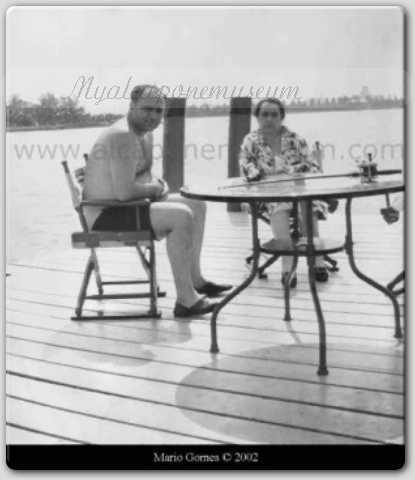 His final years, Al Capone relaxing in the sun with his mom on the dock of his Florida Mansion 1946. In this photo, his brain was affected by his disease. Note the fishing pole on the table. Though sick at the time, Al wasn't the babbling idiot in a bathrobe fishing in the pool as is often shown in Hollywood movies. That was made up through time and movies particularly in the 1975 Capone film starring Ben Gazzara. 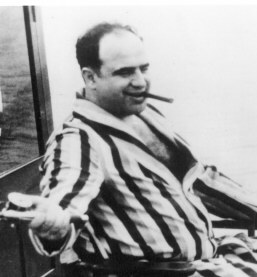 The real Capone was lucid enough and fished off the dock like a regular Joe. Since his release, the feds followed, kept daily tabs on the comings and goings from 93 Palm Avenue. 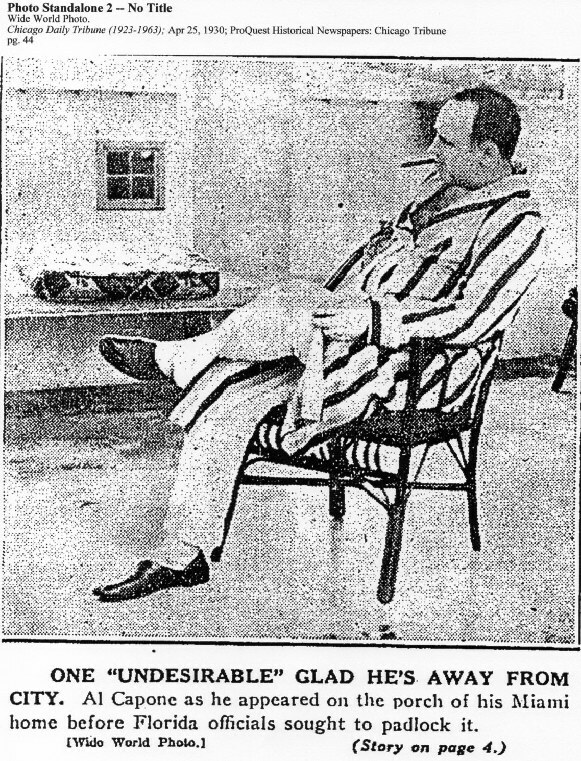 The feds foolishly thought that Capone was actually still directing the mob from his Miami home. The Myth: I saw a photo of a sickly Al with his mother after his release from Alcatraz in a recent published Capone bio. The Truth: Not exactly. This photo in question was actually taken before Al was ever sent off to prison in 1932. Here it is republished below for a 1938 newspaper story. Al Capone was released from Terminal Island in 1939, before moving on to the Baltimore Hospital for treatment. He will finally end up at his Florida home in March of 1940. Photo of Al and his mother taken before his stint in prison starting in 1932. Here it is reprinted for The Longview News Journal on April 6, 1938. The photo was originally taken in 1930-31, this way before he was released from prison in 1939. The Myth: Al Capone was haunted by the ghost of massacre victim James Clark. It got so bad he had to go see a psychic by the name of Anne Britt to make it stop. 1) If you were delusional and thought that Capone had absolutely nothing to do with the massacre like some then why would you even believe James Clark would be haunting him? 2) If Capone had something to do with the massacre like most of us believe, (which was only giving the go ahead for the hit), then why would James Clark haunt Capone and not any of the actual killers or planners? After a few days of research, this imaginary tale seems to take flight one Halloween in 1980, and is then perpetuated by Ghost tour operator Richard Crowe in 1987, which then ends up as a ghost tale in many Chicago paranormal books! Yes, I've slept in Capone's Miami house, called out his name in the dark at 2 AM taking photos and recording sound. NADA!! Stood quietly at the site of the massacre site and felt absolutely nothing! I have two massacre wall bricks were the guys were lined up and two bullets that went through the bodies right here. Nothing!! Now Paresis (disintegration of the brain cortex due to syphilis) will cause you to spew out nonsense from time to time. The Myth: Al Capone was once photographed with New York gangster Jack "Legs Diamond. Photo taken from Hank Messick and Burt Goldblatt's 1972 book. The Truth: The photo originated in Hank Messick's and Burt Goldblatt's Illustrated history of Organized crime (1972) and was touted as a new never before seen photo of Al Capone and Jack Legs Diamond together. served as the template to fake the above photo of Capone and Diamond. 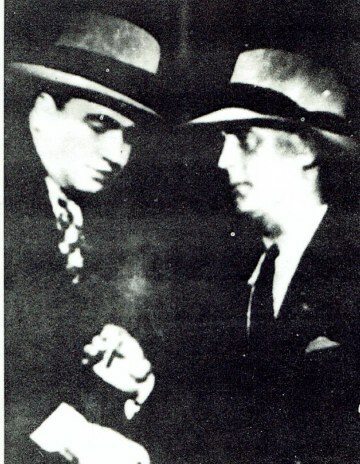 The supposed real photo of Capone and Jack Diamond is really just a made up one by using a little photo exposure darkening the subject's features and tricking Capone's tie pattern. As far as history shows, Diamond couldn't stand Capone and called him a punk on more than one occasion. I've taken a rarely circulated photo of Jack Diamond from September 22,1930. In it he is being led to the Philadelphia police station after he was arrested coming off a boat from Europe. (He was expelled from there as an undesirable). I made a transparency of that said photo and lined it up with the supposed Capone / Diamond shot. Voila! It matches Diamond perfectly! Hat band, tie, nose, hand, cigarette and hanky, even down to the little flower on his lapel. 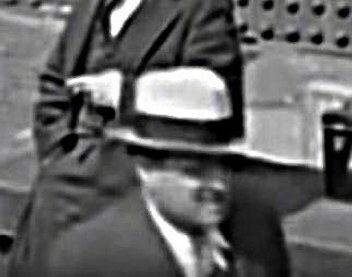 The Al Capone photo matches the exact clothes and hat he was wearing when he was photographed on his return to Chicago with his lawyer William F. Waugh on March 21, 1929. A different pose of this same photograph session was taken of Capone and was later used for the tricked Diamond photo.